Visit Norway – not Kashmir! Have you watched the newest Mission Impossible movie yet? It is called Fallout, and it has its world premiere today! We got to watch it yesterday (August 1st), and it was a great treat. People who love beautiful cities will enjoy the fantastic scenery in both Paris and London in the movie. But, we are so used to these cities, that we don’t even blink by the beauties of the Eiffel Tower, the Notre-Dame, the Arc de Triomphe, London Eye, the Parliament, St. Paul’s Cathedral, the Millenium Bridge and the other attractions from these fantastic cities on display in the movie. But, at the end of the movie, the story is changing the scenery to Kashmir, the northernmost geographical region of the Indian subcontinent. This is where the movie comes to an end, and it takes place in a beautiful environment with big mountains, snow, two wild helicopters, and then it comes… a giant cliff. It is extraordinary, it is scary, it makes your hands sweat, but at the same time… it attracts you, and makes you want to go and see it in real life. Where is it? Is it in Kashmir? Forget about Kashmir – travel to Norway! 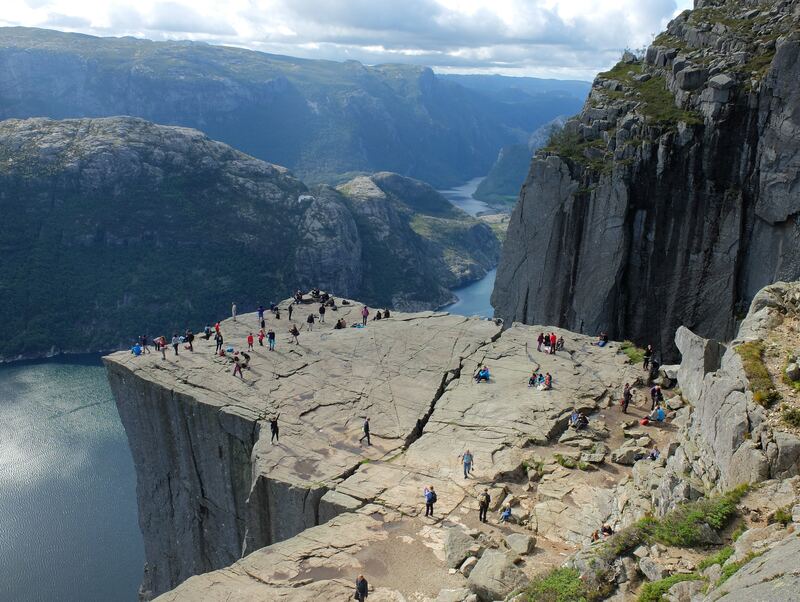 If you want to walk around in the amazing scenery seen at the end of the Mission Impossible movie, and maybe take a peak down from the cliff, then you have to travel to Norway. You can fly to the city of Stavanger, travel on towards Sandnes, and from there you can start your walk towards the Preacher’s Pulpit, or Prekestolen (in Norwegian). This is the place that gives the fantastic scenery at the end of the Mission Impossible movie. This is one of the most amazing places to visit in the world. You might be scared of heights, but it is still worth a visit. Tom Cruise enjoyed his stay in Norway as well, and on August 1st the movie actually had a premiere at the Preacher’s Pulpit in Norway with more than 1000 people attending. I have watched the movie, and it is absolutely worth watching. The Mission Impossible movies are always a combination of heavy action and lots of humor, making it ideal for a large audience. And with the amazing scenery from Norway in the end, this is a must-see movie. Again, forget about Kashmir – Norway is the place to visit if you want to discover the fantastic scenery from the grand finale of the Mission Impossible: Fallout movie.